The Chicago Cubs will phase out print-at-home tickets at Wrigley Field over the next year, citing the flagrant use of counterfeit tickets during the postseason and World Series. WRIGLEYVILLE — The Chicago Cubs are cracking down on counterfeiters, moving to phase out print-at-home tickets for single-game tickets at Wrigley Field. The postseason proved lucrative not only for the Cubs, but also for scammers who passed off hundreds of fake tickets to unwitting fans who were subsequently turned away at the gates. To lessen the risk, the club said it will stop offering tickets that can be printed at home for the 2017 season, leaving single-game customers with options like getting tickets mailed or printed at will call. The only instant delivery option will be via the Major League Baseball Ballpark smartphone app. It was not clear how fans will access tickets they buy through StubHub, a sanctioned venue for secondhand tickets. Currently, the resold tickets are delivered electronically to be downloaded and printed. The Cubs said more information on mobile ticketing and StubHub resales will be available when single-game tickets go on sale Feb. 24. Season ticket holders will still receive the commemorative tickets, but can also access tickets on the Ballpark app, the club said. The change will not affect tickets for concerts at Wrigley Field. During the Cubs Convention, Colin Faulkner, vice president of sales and marketing, said the lucrative resale market created "an incentive for people to commit fraud," something the team found "disheartening" in turning away fans with printed tickets that turned out to be phony. Cubs Chairman Tom Ricketts said the team was working persistently to address scalpers and ticket brokers gobbling up seats, even as season ticket holders, primarily to sell them at a profit. "It can be a problem at times," he said. Ricketts said the team monitors its database of season ticket holders and "we try to weed those people out" by removing them. "It's really hard to control," he added. "We try to keep real tickets in the hands of real fans, but it's not as easy as it looks." In October, the Cubs went so far as to offer pointers on how to spot fake tickets, while still recommending that fans avoid the risk by using the affiliated StubHub website for secondhand buys. Several examples of print-at-home tickets that turned out to be fakes had glaring errors like overlapping blocks of text, blurry barcodes or ticket receipts passed off as actual tickets. 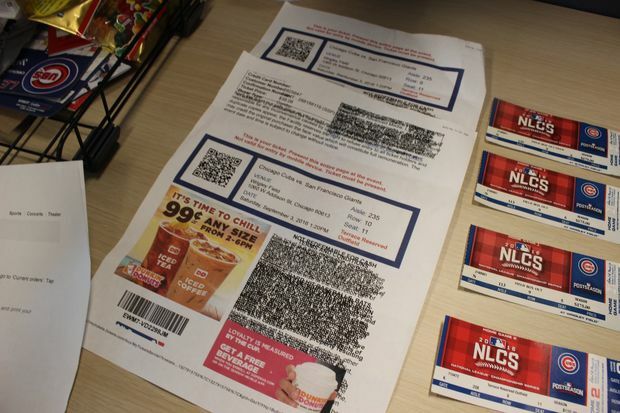 But no matter how convincing a counterfeit ticket might appear, its barcode will be invalid, Cubs spokesman Julian Green said during the postseason. "They're working very hard to try to beat the system," Green said of scammers. Tickets reselling for up to $14,500 "suggests to criminals that there is tremendous value to be made," he added.